San Francisco – March 30, 2016 – 8ninths was named today by Microsoft Corporation as one of seven companies chosen for the Microsoft HoloLens Agency Readiness Program, and will showcase their “Holographic Workstation”™ prototype, designed and engineered for Citi, this week at Microsoft Build 2016. 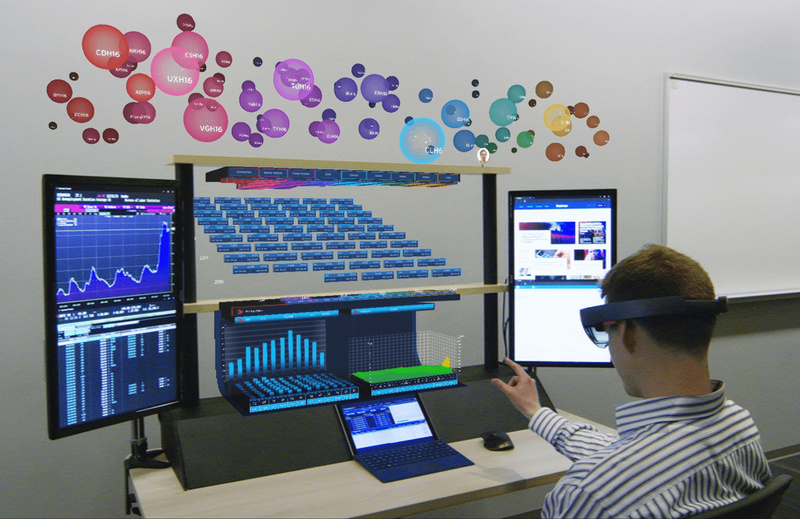 The Holographic Workstation™ increases efficiency by using the Microsoft HoloLens platform to create 3D holograms of real-time financial data. A three-tiered system of dynamically updated and interactive information enables traders to view, process, and interact with large amounts of abstract data in a combined 3D and 2D environment. The physical workstation integrates tablet screen space, 3D holographic docking space, keyboard, mouse, gaze, gesture, voice input, and existing Citi devices and workflows. “8ninths has created a business solution in the financial industry that revolutionizes the way people will interact with and best use financial data in a compelling and competitive way,” said George Zinn, corporate vice president and treasurer at Microsoft. 8ninths – one of the first seven companies selected to go through the Microsoft HoloLens Agency Readiness Program – designed and engineered the physical workstation to address business problems and challenges traders currently face working with large amounts of information with limited screen real estate. 8ninths engineered a new 3D holographic system that organizes data by tiers. Ambient, high-level market conditions are represented in holographic spheres hovering at the top of the workstation like a cloudscape or weather system. Traders use hand gestures and voice to drill further into market segments and filter financial instruments to trade in the middle tier. The lowest tier comprises the ‘Holographic Stage’ where the trader can view historical and real-time performance before executing a trade as well as remotely collaborating with others at room-scale. This new paradigm leverages the way the human brain cognitively processes the physical world and builds upon and enhances the typical workstation configurations of multiple 2D screens containing financial news terminals, email, chat, and other financial applications. The process of developing a holographic trading workstation began with 8ninths partnering with Citi to understand the current workflows traders use, and the real-world problems these systems create. 8ninths identified a core set of problems stemming from the traders use of large amounts of raw data in 2D format that limited collaboration between traders, as well as how the traders accessed, interacted with, and processed the data. 8ninths developed their own design patterns and language to explore how Microsoft HoloLens could be used to evolve 2D data into a 3D, holographic experience in a way that would address current workflow and data problems in an all new, real-world application. The tiered system of holographic information organized from micro level at the base, to macro level at the top, created a whole new way of thinking about the workstation. The new “Holographic Workstation”™ optimizes a trader’s ability to interact with data in a tiered system; extract meaning from the data quickly and accurately; and collaborate in a whole new way. “Once we defined the problems, we were really excited to see how we could design a new way for people to better visualize, interact with, and gain insights through a holographic experience. We were in uncharted territory, and that’s a space we thrive in – applying our knowledge, the newest technology, and real world problems to engineer something truly innovative and beneficial to our partners,” said Heather Raikes, Creative Director at 8ninths. Founded in 2008 by long-time Microsoft veterans Adam Sheppard and William Lai, 8ninths is a 12- person, Seattle-based, design and development studio providing Mixed and Virtual Reality content, applications, and solutions. “8/9” of an iceberg is hidden below the water and the iceberg is a metaphor for what they do in the world of technology. They explore non-obvious, new, and emerging technologies. Partnering with large enterprise customers, 8ninths helps them utilize those technologies through envisioning, designing, engineering, and deploying custom solutions to meet their objectives in the most innovative and competitive way. They believe strongly that Mixed and Virtual Reality is the next huge wave in technology. As one of a handful of companies selected by Microsoft Corporation for their Microsoft HoloLens Agency Readiness Program, 8ninths is actively developing holographic applications for clients. 8ninths is partnered closely with Microsoft HoloLens, Samsung, Oculus, HTC Vive, and others to develop solutions on a wide variety of emerging Virtual and Mixed Reality platforms. To see video of the Holographic Workstation for Citi and a presentation from Microsoft Build 2016, please click here. To access the full Press Kit, including images, gifs, presentation, logos, and video, please click here. For more information on 8ninths, please visit, http://54.202.5.168. For media inquires, please contact, press@54.202.5.168. “Holographic Workstation”™ is a trademark of 8ninths, LLC.